While ISO has framed the findings pessimistically, claiming that their analysis shows that insufficient fuel for gas-fired power plants is a threat to reliability in a Reference case, ISO’s modeling is based on some flawed assumptions. Despite its own assertions that higher levels of imports and renewables can minimize system stress and maintain reliability, its Reference Case unrealistically underestimates the likely future impacts of those resources, undermining their contribution to system reliability. ISO also overestimates future electric and gas needs, assuming unrealistic demands on our energy systems. 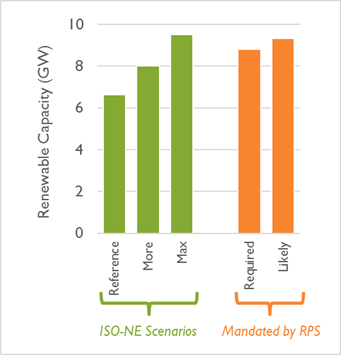 If the ISO correctly modeled the renewable portfolio standard (RPS) policies, legally mandated by all six New England states, the Reference case would contain an additional 2,200 MW of renewables (see Figure 1). When built, many of these renewables, such as onshore and offshore wind, will be available to meet winter peak demand. If the Reference Case accounted for new electricity imports from Canada, as required by Massachusetts laws and regulations, imports would increase by 1,000 MW. If the Reference Case correctly modeled the current availability of LNG imports at 1.25 Bcf/day as noted by NEPOOL stakeholders, fewer reliability issues would result from stresses on interstate pipelines during supply emergencies. ISO overestimates demand growth for electricity in all scenarios. Its assumption of electricity demand during the winter peak undervalues energy efficiency measures that are in place today. Their demand estimates are superseded by ISO’s own updated 2018 forecast for demand, which was not used in this analysis. ISO overestimates demand growth for gas in all scenarios. Its assumption for increases in gas use is more than double the rate of recent historical trends. For more on our examination of the ISO's draft Operational Fuel Security Analysis, see our factsheet.